Tourist vehicle operators across Sikkim have threatened they would not allow any taxis bearing Bengal registration numbers to enter the hill state unless the permit issue is resolved within a few days even as the government in Bengal is trying to seal a reciprocal transport agreement. Bengal and Sikkim had struck a reciprocal transport agreement on April 9, 2007, wherein vehicles from Bengal could enter only three Sikkim towns - Gangtok in East, Pelling in West and Namchi in the South. Vehicles from Sikkim though could move all over Bengal. According to the agreement, sources in the Bengal's transport department said, all vehicles that have been included in the agreement could enter Bengal with a permit issued to them. After entering Bengal, these permits had to be countersigned at different entry points. The vehicles included under the agreement are buses, goods vehicles as well as contract carriages. This agreement was cancelled on August 30 as tourist vehicle operators in Bengal have been long complaining to chief minister Mamata Banerjee about how several thousands of operators were taking a beating because of the truncated movement of vehicles to Sikkim. "We had repeatedly drawn the attention of the chief minister about how tourists planning to visit Sikkim from New Jalpaiguri were facing problems. If someone had to reach Gangtok, he would have to get off a vehicle bearing Bengal's registration number, hire a vehicle of Sikkim and then reach the hotel," said Samrat Sanyal of the Eastern Himalaya Travel and Tour Operators' Association. "It's time that both the states agreed to sea-mless connectivity." In September 2015, Bengal chief minister Mamata Banerjee had written to her counterpart in Sikkim, Pawan Chamling, requesting that all tourist vehicles entering the Himalayan state be given access to all points in the hill state. Over the next few months with no response reaching Nabanna, Bengal decided to terminate the agreement in August after nearly a decade. "Since then we have sent several letters asking for a mutual agreement. But there was no response," a transport department official in Bengal said. In October, the department sent a senior officer to Siliguri and Sikkim for a thorough understanding of the situation. A report to the government submitted later that month identified key problems, including how jeeps, taxis and other vehicles were entering Bengal without bothering for any counter-signature of the permits. Sikkim was running few buses and more small vehicles, including jeeps and taxis, resulting in congestion on its hilly roads. Most of these vehicles belonged to the category, which were not included in the mutual agreement. Operators in Sikkim today rose in protest after the regional transport authorities started slapping fines on each vehicle that didn't have its permit countersigned. "They are imposing on us a fine of Rs 4,000 for one vehicle for not having a countersigned permit. This is too much. The passengers are getting harassed and those vehicles that don't have permits are being asked to return," said Dawa Tamang, a driver in Gantok. Around 3,000 taxis including trucks from Sikkim enter Bengal everyday. 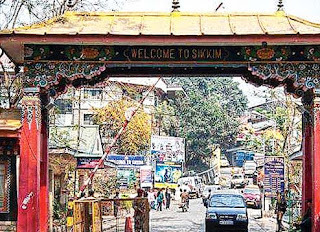 In contrast, only 1,500 tourist vehicles reach Sikkim everyday. The members of different driver and vehicle associations also highlighted how vehicles of Sikkim have to get two different permits for Darjeeling and Jalpaiguri districts. On the contrary, vehicles from Bengal plying to Sikkim need to have only one permit for travel. Operators today met transport secretary SBS Bhaduria to voice their grievances.